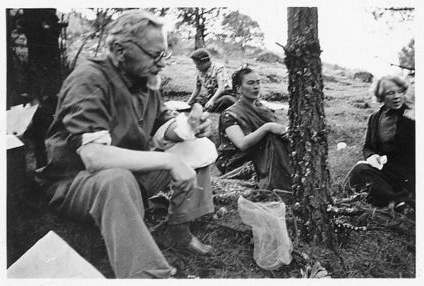 Leon Trotsky (left) with his wife Natalia (right) and their friend Frida Kahlo (center foreground) having a picnic in the countryside near Mexico City - a break from political work and the worries of his struggle against Stalin. Leon Trotsky (1879-1940) spent most of his adult life in exile, first banished by the tsarist government and later expelled from the Soviet state that he’d created. Stalin had Trotsky condemned to death in a show trial organized in Moscow in 1936. After that it was only a matter of time before a Soviet assassin would strike the fatal blow. A Soviet propaganda image depicting Trotsky, Military Commissar of the newly formed Red Army, as St George slaying the dragon of "counter-revolution". Trotsky's image was also used in anti-Bolshevik propaganda, which often focused on his Jewish heritage in order to appeal to Russian anti-semitism. The funeral of Soviet spy chief Felix Dzerzhinsky, 1926. Trotsky (second from left) acts as a pallbearer, as does Stalin (right). In the power struggle that followed the death of Lenin, Trotsky was pushed out by Stalin, who emerged as the dictator of the USSR. Trotsky's study in his villa in Coyoacan, a suburb of Mexico City. Trotsky and his wife were granted asylum in Mexico in 1937, and they lived there until his assassination in the summer of 1940. The house is now a museum. The grave of Leon Trotsky and his wife, Natalia Sedova, in the garden of their home in Coyoacan. Their grandson, who lived with them in Mexico, has maintained the house as a museum to the life and work of Trotsky, who was known affectionately as the "Old Man".